Recent opinion polls in Spain have indicated that the left-wing Podemos (‘We Can’) party, which was only formed in January of this year, could gain the largest share of the vote in Spain’s 2015 general election. Paul Kennedy assesses the challenge the party poses to Spain’s traditional two-party system. He writes that a key indicator as to whether Podemos can translate its opinion polling numbers into actual support will be how it fares in upcoming regional and local elections in May. The threat posed by Podemos (We Can) to Spain’s two-party system remains in place six months after the new political force obtained over 2.25 million votes and five seats at the European Parliamentary elections. An opinion poll carried out for El País at the start of November indicated that the movement led by Pablo Iglesias would, in the event of a general election, obtain greater public support than both the governing People’s Party (PP) and the chief opposition party, the Spanish Socialist Workers’ Party (PSOE). Podemos accounted for 27 per cent, 1.5 per cent more than the PSOE and 7 per cent more than the PP. A further poll published the same week by the Sociological Research Centre (CIS), which carries out quarterly surveys for the Spanish government, nevertheless indicated that the PP remained in the lead (on 27.5 percent), ahead of the PSOE (23.9 per cent) and Podemos (22.5 per cent). The Chart below shows the predicted vote share (as calculated by CIS) for Spanish political parties since the beginning of 2013, alongside the growth in support for Podemos over recent months since the European Parliament elections in May. With stagnant growth across the Eurozone’s major economies threatening to choke off Spain’s incipient recovery, the government is struggling to retain support. A seemingly never-ending series of corruption allegations have further undermined the PP’s credibility: the Spanish Prime Minister, Mariano Rajoy, received the lowest ranking amongst political leaders in the aforementioned CIS poll. The fact that Pablo Iglesias was absent among the list of Spain’s most prominent politicians in that survey – his party, only established in March 2014, does not have the parliamentary representation required to merit his inclusion in that section of the survey – is unlikely to have troubled Podemos. Iglesias did feature in the survey carried out for El País and he was the only political figure capable of obtaining a positive ranking (more approval ratings than disapprovals). Although there are indications that the PSOE has finally stemmed the decline in its support under its new leader, Pedro Sánchez, who was elected in July, there appear to be significant numbers of people disillusioned with both main parties. 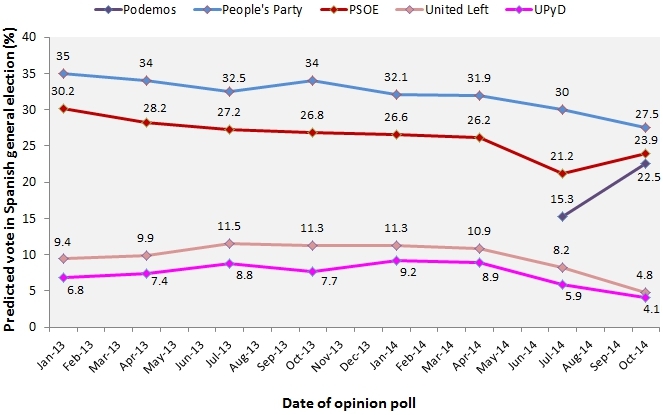 Whether this dissatisfaction translates into actual support for Podemos at the general election, which is due to be held in November 2015, remains to be seen. The party’s idealistic pronouncements have found favour in a country which still has one in four of its working population unemployed, and the party organisation has proved to be media-savvy in conveying its critique of the current political system to the general population. Given the severity of Spain’s economic situation, it is nevertheless the case that advancing a critical analysis of the status quo is immeasurably easier than developing a practical programme of government. In short, Podemos has yet to convince as a credible party of government. With respect to the economy, critics have indicated that the party has proposed a number of policies which may prove problematic in practice, including public debt restructuring; the introduction of a French-style 35-hour working week; the lowering of the age at which the state pension can be collected; and the repeal of key elements of the PP government’s 2012 labour market legislation. Looking to the future, leading figures within the party initially indicated that Podemos would not put forward candidates at the local and regional elections to be held in May 2015, so as to concentrate on the general election six months later. Pressure from supporters nevertheless forced the leadership to reconsider this stance at both the local and regional level. At the former elections, Podemos will form part of the Ganemos (Let’s win) coalition, together with the Communist-dominated United Left (IU – Izquierda Unida) and Equo, which comprises a number of green parties. At the regional level, Podemos intends to fight the elections alone. Both sets of elections are likely to be challenging for Podemos, given that the party has yet to develop formal organisational structures throughout the country. A good set of results will nevertheless set a marker for the subsequent general election, and will confirm that the polling results outlined above provide a true indication of the country’s voting intentions. Dr Paul Kennedy is Lecturer in Spanish & European Studies at the University of Bath. He is the author of The Spanish Socialist Party and the modernisation of Spain (Manchester University Press: 2013). United Left (Izquierda Unida) is not a Communist-dominated party as stated in this article. Only 3 of the 11 deputies from IU in the Congress belong to the PCE (Communist Party of Spain). The other deputies belong to Los verdes (the greens), Izquierda Abierta (Open Left etc. However, it is a left-party, and belongs to the EUL/NGL group in the European Parliament. I think you can’t write about PODEMOS without mentioning corruption. And that Spain is not a country with special economical problems. Is a country that, on the ground, has not gone beyond the dictatorship. No matter how democratic its rules could look like. Thus, this duality makes corruption, structural. I wrote this in 2012, to explain why is corruption structural (the link is to a shorter version edited by a USA blogger) . And I think we are heading to an Italian-style crisis, as I predicted in 2013, e.g in my comments (although not very good ones) to The Economist articles “Why Spain´s left is in a Funk” and “Spain´s government: Another blow”. In that landscape, the main point that PODEMOS offers is to put and end to corruption, establishing a Popular Democracy. I think they truly believe that is Democracy. But there are many people that believes that the most democratic country in the world is CUBA. What they offer is a benevolent dictatorship. I think that is perceived in Spain and that the most probable outcome will be a left-wing-coalition government like The Olivo in Italy was. Financial markets vs Brussels: What is the best anchor for policies?